The Airbus Helicopters EC155 B1 is a medium-weight multi-role utility twin engine helicopter accommodating up to 12 passengers and 2 crew. The EC155 B is a development of the AS 365N Dauphin II, with 40% larger cabin area, a new five-bladed Spheriflex main rotor with an extremely low vibration level and 'glass cockpit'. The EC155 B1 is powered by a pair of Turbomeca Arrius 2C2 turbine engines. The new generation of Fenestron tail rotor takes part in the decrease in external noise level. This tail rotor has 10 blades spaced irregularly around the hub. Development of the EC-155, initially known as AS-365N-4 Dauphin started in September 1996. The development of the AS365 N4 wide body helicopter was announced at International Paris Airshow in June 1997. A mockup of the N4 was shown at the International Paris Air Show at Le Bourget and on 17 June 1997, the prototype EC155, F-WDFK, a rebuilt Dauphin, flew first at Marignane. The first pre-poduction EC155 B flew on 11 March 1998. The French Civil Aviation Authority (DGAC) and the German Government Agencies (LBA) certification was awarded in December 1998 and the EC 155 got its single-pilot IFR certificate on 25 January 2000. The first three Eurocopter EC 155 Bs were officially handed over to the German Federal Ministry of the Interior / Bundesgrenzschutz (BGS) at the Bonn-Hangelaar base of the BGS on 16 March 1999. The EC155 B1 is a development of the EC155 B with more powerful engines and improved performance at high altitude and in hot temperature conditions. Deliveries of the EC 155B1 version began in September 2002. More than 170 EC155s have been sold. The ICAO Aircraft Type Designator for the EC155 helicopters is EC55. Since March 2015, Airbus Helicopters uses “H155” as marketing designation for EC155 helicopters. On 29 August 2003, the Airbus Helicopters EC155 B1 c/n 6660 was registered N155EW in the USA with Wells Fargo Bank Northwest NA Trustee. On 17 November 2003, Dauphin II N155EW was registered with Tex-Air Helicopters Inc., Houston, Texas. On 31 March 2005, Tex-Air Helicopters and ERA Aviation merged and the EC155 B1 N155EW was registered with ERA Helicopters LLC, Lake Charles, Louisiana. On 20 September 2006, registration N155EW was cancelled as exported to Denmark and the next day, the aircraft was temporarily registered in Denmark as OY-HSK with DanCopter A/S, Holsted. 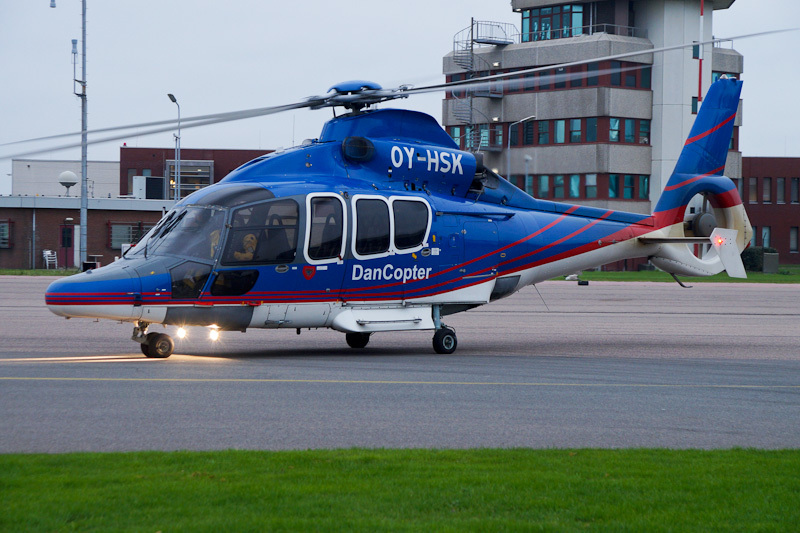 On 26 February 2007, the 2003-built EC155 B1 was registered OY-HSK with DanCopter A/S, Esbjerg. On 19 November 2014, the DanCopter A/S' EC155 B1 Dauphin II OY-HSK was seen at the Den Helder-De Kooy in Holland.